Eight boxes P, Q, R, S, T, U, V and W are kept one above another in such a way that the position of bottom most box is numbered one, the above one is numbered two and so on till the position of the topmost box is numbered 8. The boxes were in different colours viz., Violet, Blue, Black, Green, Yellow, Red, Maroon and White. Each box having different number of sweets in that viz., 19, 25, 32, 38, 43, 47, 55 and 67. The given above information are not necessary to be in the same order. The number of sweets in the box is does not match with the multiples of the position of the boxes were kept except bottom most box. Three boxes are kept between box P and the box which has number of sweets in multiple of 11, which is kept one of the even numbered position. The Maroon coloured box is kept immediately above the Box P but not in the third position.Two boxes are kept between the Maroon coloured box and the box U. Only one box is kept between U and the box which has the sweets in multiple of the lowest number of sweets.Box T is kept immediately below the Yellow coloured box. 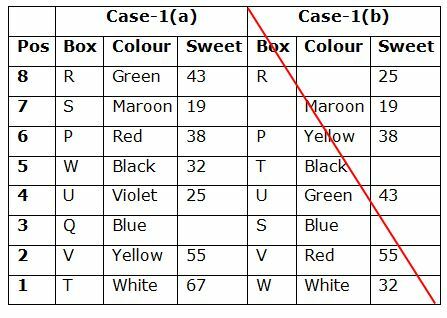 Two boxes are kept between T and the box which has the sweets in perfect square of a number, which is does not kept below the box T.As many boxes are kept above the box V is same as the boxes kept below the box which has lowest number of sweets. The Blue coloured box is kept immediately above the box V. The Blue coloured box does not kept at topmost position. Two boxes are kept between box W and the Green coloured box. The green coloured box has 11 sweets more than the sweets in the box W, which does not kept at the topmost position. The Red coloured box is kept immediately below the box S. As many boxes kept between box U and the White coloured box is same as the boxes kept between the box R and the Black coloured box. The box U is not in Black colour. 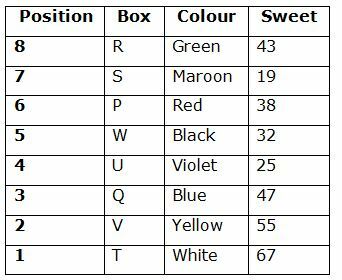 The box R does not has the lowest number of sweets.Neither Blue nor Black coloured boxes has the maximum number of sweets. 1. Which of the following coloured box has the lowest number of sweets? Three boxes are kept between box P and the box which has number of sweets in multiple of 11, which is kept one of the even numbered position. The Maroon coloured box is kept immediately above the Box P but not in the third position. 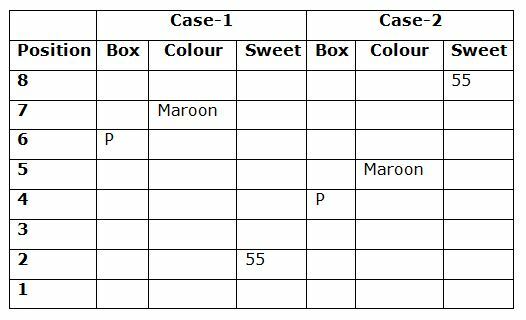 Two boxes are kept between the Maroon coloured box and the box U. Only one box is kept between U and the box which has the sweets in multiple of the lowest number of sweets. Box T is kept immediately below the Yellow coloured box. Two boxes are kept between T and the box which has the sweets in perfect square of a number, which does not kept below the box T.
As many boxes are kept above the box V is same as the boxes kept below the box which has lowest number of sweets. The Blue coloured box is kept immediately above the box V. The Blue coloured box does not kept at topmost position. Two boxes are kept between box W and the Green coloured box. The green coloured box has 11 sweets more than the sweets in the box W, which is does not kept at the topmost position. The Red coloured box is kept immediately below the box S. As many boxes kept between box U and the White coloured box is same as the boxes kept between the box R and the Black coloured box. The box U is not in Black colour. The box R does not has the lowest number of sweets. Neither Blue nor Black coloured boxes has the maximum number of sweets. 2. How many boxes are kept between the box Q and the Red coloured box? 5. What is the average number of sweets in the box Q and the Maroon coloured box? In the question below a statement is followed by two assumptions numbered I and II. An assumption is something supposed or taken for granted. You have to consider the statement and the following assumptions and then decide which of the assumptions is implicit in the statement. I. In India at least two-thirds of the working population earn their living through agricultural works. II. The existing levels of food consumption in these countries are very low and with a little increase in the capita income, the demand for food rise steeply. Only assumption II follows because with a little increase in the capita income, their demand for food is rise. 7. Statement: Many banks have a fee structure in place for customers who use the convenience of ATMs. Conclusions: I. Criminals target ATMs, so using an ATM could place you at risk for robbery after withdrawing money from the machine. II. If you use ATMs inside your bank’s network, you do not incur a fee. Only II follows because if you use ATM inside your bank, then they will not charge any amount for using ATM. Directions (8-10): In each of the following questions, two statements numbered I and II are given. There may be cause and effect relationship between the two statements. These two statements may be the effect of the same cause or independent causes. These statements may be independent causes without having any relationship. Statement I: Passing a bill is one easy thing to do, what is important is to make parents, particularly in rural areas, aware of the benefits of education and to make them send their children to school. Statement II: The Right to Free and Compulsory Education Bill will now guarantee 25 per cent of places in private schools are reserved for poor children. Both are effect of common cause.Both are effect of giving free education. Statement I: UIDAI has made it mandatory that from June 01, 2018 all the agencies that does Aadhaar authentication should accept Aadhaar Virtual ID from the applicant. Statement II: Any retailer who denies to do verification by using the Aadhaar Virtual ID will face severe penalty from the government. Statement I implies that all the agencies should accept the virtual ID. Statement II implies that the retailer who denies the virtual ID authentication will face severe penalty from the government. 1) Which of the following coloured box has the lowest number of sweets? 2) How many boxes are kept between the box Q and the Red coloured box? 5) What is the average number of sweets in the box Q and the Maroon coloured box? 6) In the question below a statement is followed by two assumptions numbered I and II. An assumption is something supposed or taken for granted. You have to consider the statement and the following assumptions and then decide which of the assumptions is implicit in the statement. 7) Statement: Many banks have a fee structure in place for customers who use the convenience of ATMs. I. Criminals target ATMs, so using an ATM could place you at risk for robbery after withdrawing money from the machine. II. If you use ATMs inside your bank’s network, you do not incur a fee. 8) Statement I: Passing a bill is one easy thing to do, what is important is to make parents, particularly in rural areas, aware of the benefits of education and to make them send their children to school. 9) Statement I: UIDAI has made it mandatory that from June 01, 2018 all the agencies that does Aadhaar authentication should accept Aadhaar Virtual ID from the applicant. 10) Statement I: Measuring customer satisfaction provides an indication of how successful the organization is at providing products and/or services to the marketplace.